Long synonymous for its sand, surf and sun (and the laidback lifestyle associated with it), Surfers Paradise has shaken off its identity as a high-rise retirement village and party playground for schoolies to adopting a more cosmopolitan vibe as hip new bars, cafes, restaurants and even breweries continue popping up left right and centre as the population (and skyline) continue to grow. It could be argued the increase in these types of amenities reflect the changing population demographics of Surfers Paradise, with residents increasingly seeking an urban lifestyle that is more synonymous with the likes of Sydney, Melbourne and Brisbane. The continued trend of high-rise development in Surfers Paradise doesn't look like abating anytime soon, with the area boasting a healthy pipeline of projects - Urban.com.au is currently tracking 32 developments in Surfers Paradise. Chevron Island is also beginning to shake off its retirement village tag, with a number of new developments seeking to take advantage of the island's proximity to golf courses, parklands, the bustling retail along Surfers Paradise, and the sand and surf beyond. 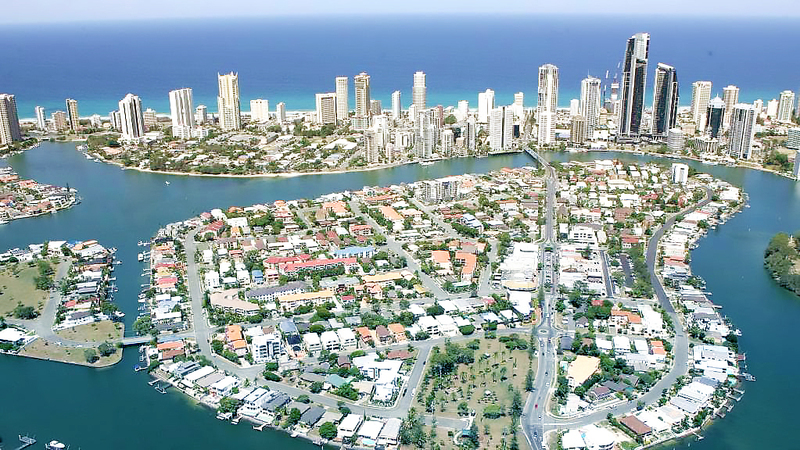 Located a 5 minute stroll west of Surfers Paradise, Chevron Island is a medium density residential neighbourhood comprising a community of 1,500 residents and over 150 local businesses. It is linked by two bridges to Southport and Bundall to the west and to Surfers Paradise to the east, and provides a unique shopping destination for locals and visitors alike. Previously known as Goat Island, Chevron Island is a natural island formation that once hosted a cattle farm.The profile and topography of the island were modified in the 1950s by detaching the island from where HOTA now exists and through sand fill. Developments such as Benson Property's Chevron One and Macquarie York's Allure will change the dynamic of the neighbourhood with the projects representing the first high-rises to be developed on the island and in effect extending the Surfer's Paradise skyline. Chevron One is a $230 million, 40-storey tower of 247 apartments designed by Marchese Partners currently under construction only 500m away from Surfers Paradise. Speaking to Media Hunt, Bensons chairman Elias Jreissati noted that the Gold Coast's continued evolution is part of the reason the Melbourne-based development company has turned its attention north. “We are seeing a major transformation taking place on the Gold Coast, and with that the city is becoming as rich in urban lifestyle as any of our capitals. It’s one of the reasons we have been looking to invest in the region for some time. The Gold Coast has always been an aspirational leisure destination, and that will always be the case. However, the Commonwealth Games has brought with it a new energy that people are only now starting to realise. “This has lifted the pulse of change, including the desire for a cultural heart which we warmly welcome, and there’s no stopping that now. We’re seeing the city setting itself up for a golden era of growth and Chevron Island is on the cusp of playing its role in this transformation." The Gold Coast Commonwealth Games, which were hosted last year and put the Gold Coast firmly in the spotlight also brought with it further investment in infrastructure and amenities from both Government and the private sector. The Parklands project, located 5km from Surfers Paradise, was designed and developed by Melbourne-based ARM and Grocon respectively, to initially host athletes for the Games, before reverting to accommodation for health and knowledge professionals from nearby Gold Coast University Hospital and Griffith University. It is also one of Australia’s first build-to-rent developments. ARM are also working on the Home of the Arts Master Plan a stone's throw from Chevron Island. The first stage of the project was completed in 2017 with future stages to be delivered through to 2023. Urban.com.au's own Mark Baljak has previously provided a summary of some of the developments mooted for the island as it transforms into a high-rise neighbourhood.